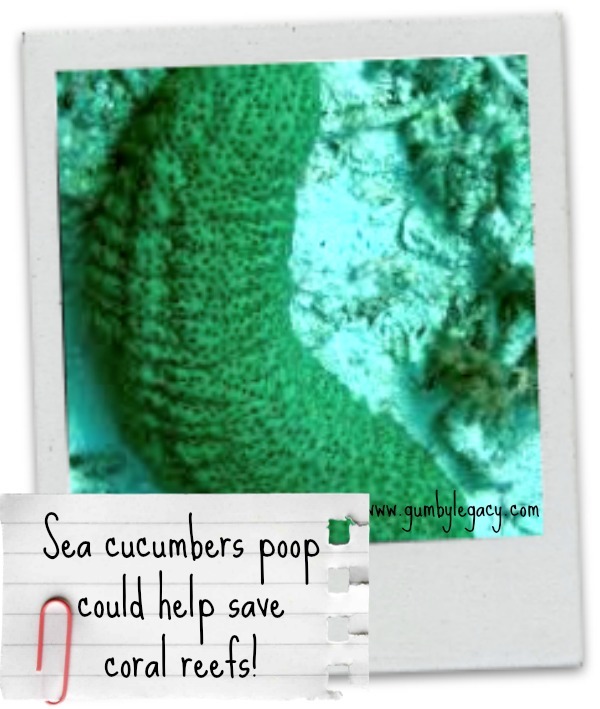 Sea cucumbers poop could save coral reefs! You are here: Home / Loving Nature / Sea cucumbers poop could save coral reefs! Woohoo – finally a critter that is not on the endangered list! In fact, they occur all over the world, at all depths and tend to live in such large colonies , often found at 220 individuals per square meter on some parts of the ocean floor. These peculiar creatures look and act very much like slugs (yuck) but I am truly astounded by what I have found out about them. I shouldn’t be surprised really, every creature we’ve covered so far has had surprising hidden qualities making it a vital part of its own little eco system and therefore the planet in general. Sea cucumbers are certainly no exception. Their biggest claim to fame and ecological importance is the fact that their poop plays a major part in keeping the habitat that they are living in, healthy. There are many different ways that their poop can help clean up different habitats and provide nutrients for marine life, as this article explains, but they are especially important for coral reefs. Coral needs calcium carbonate for its skeleton to grow at an equal or better rate to the rate at which it is losing its skeleton (calcium carbonate) via erosion, pollution, natural causes etc. When the sea cucumber eats and digests sand, rubble and other things from around the reef, it produces calcium carbonate in its poop which the coral can then use to build itself up. In normal conditions, the ocean environment is neutral – neither acidic nor alkaline. Global warming is causing the ocean to become more acidic as it takes in more carbon dioxide from the atmosphere. Calcium carbonate is alkaline so it stands to reason that the more poop that sea cucumbers produce, the more alkalinity they could provide to control or buffer the increase in acidity which is causing disruptions in many aspects of marine life and especially affecting coral reef ecosystems. Whilst wild sea cucumbers are still abundant, numbers have decreased significantly as they are a sought after delicacy in Asia with alleged medicinal and aphrodisiac properties as well. As they become more affordable in China, the demand has increased exponentially, resulting in it being difficult to ‘fish’ for them in easily accessible areas. As a result, sea cucumber aquaculture (farming) is now being successfully carried out in various locations around the world. With a kilogram of sea cucumber being sold for hundreds, even thousands of dollars at their final point of sale, (it would appear I may be in the wrong job!) but what a fantastic opportunity for these communities. I haven’t found anything yet to say that sea cucumbers are being farmed and utilised specifically for their potential coral reef and ocean saving properties but I hope there is a plan to do this at it does seem relatively fool – proof (?). Well, I never! I would love to know if anybody already knew that about sea cucumbers – I for sure didn’t!